We’re on the edge of summer which means winter is on its way, and comfort food is definitely on the agenda! This particular blog is for all of those who have spent their long summer evenings outside foraging (legally we hope!) for fruit and still have bundles of fresh produce left over from their summer salads… The go-to dishes for using up edible goods are usually pies and crumbles, along with other sweet desserts. We’re feeling a bit jammy this year – so let’s make jam! The best thing about jam is that you can use it all year round and you can use it with some of the most simplest of cuisines to brighten up your misty mornings. You can mix it in with your morning porridge, plod it on top of your toasty crumpets or scoop it up with a wedge of bitter sweet cheese – oh so tasty! 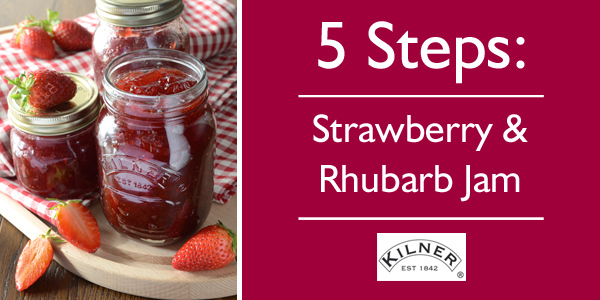 Before you start making your strawberry and rhubarb jam you will need to sterilise your jam jars and equipment. 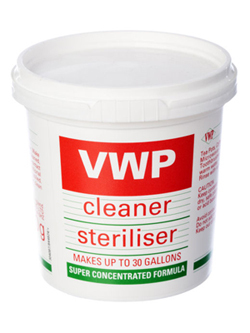 This is very simple to do; all you need is a pot of VWP Cleaner Steriliser and warm water. How to sterilise: Dissolve 1 – 2 teaspoons of VWP in a gallon of warm water and soak your equipment for a good 10 – 15 minutes. Rinse all equipment under cold running water. For extra dirty equipment use a stronger solution and leave it to soak for longer. After doing this place a small plate in the fridge to chill as you will need it for testing at the end. Make sure you rinse the fruit well. Slice your rhubarb into small equal cubes and hull your strawberries. Place into a jam pan and drizzle the lemon juice over the top of the fruit. Next, sprinkle the jam sugar to the mix and cook on a low heat until the fruit is soft and oozing with juice. Stir occasionally with a spoon until the sugar has vanished ready for boiling. To hull: Hulling means to de-core your strawberries – removing the leaf and hard centre. Using an everyday potato masher squish the cooked fruit until it turns to pulp and then bring to a boil. Every so often your jam will develop a layer of “froth” that will sit on top of your mixture, simply scoop it away whenever it appears. Jam is cooked until it reaches setting point, this is usually at 105ºC; you can use a specialised jam thermometer to measure the temperature of your preserve. Testing the setting point: To see if the jam has set properly, you will need to use the plate that you chilled in the fridge earlier. Using your wooden spoon, scoop up a small amount of the mixture and plop it onto the plate. Wait for the mixture to cool, so that you don’t burn yourself, and then push your finger through the jam and see if it wrinkles. If your mixture does wrinkle then that means that it is done; if it doesn’t then that means it needs to be cooked for longer. 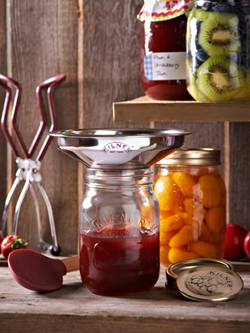 For a smooth jam you will need to press the fruit through fruit straining bags with a spoon into your clean jars. However, if you prefer your jam to have a natural seedy texture to it, then simply pour the mixture from the jam pan straight into the jars. Then seal and label your jars. Top Tip: To create less mess when filling up your jars you can use a funnel that has been specially designed for loading up the jam jars. The refreshing and sweet taste of summer fruits is sure to aid you through those long winter months. So now you can tick off the box that says “hibernation food” on your preparation list because you are all set for feasting your way through winter. P.S. Homemade preserves make great Christmas presents! Jam, Jam jars, Kilner, Le Parfait, Lefheit, making jam, Preserving, PYO, Rhubarb Jam, Setting Point, Strawberry Jam, Summer Fruits. Bookmark.